This week's Raw was another decent show, though not quite spectacular. We did see the Universal champion make an appearance along with a Raw Women's title match, but nothing noteworthy happened. With three weeks until Wrestlemania, WWE better put their pedal to the metal when it comes to their stories. Let's take a look at my four takeaways from this week's show. Note: Before I begin, I'd like to shout out The Enzuigiri. We are a group of long-time wrestling fans living in the Tri-State area. We have results, news, interviews, and so much more! Please check out our podcast, Reddit, and Facebook page! 4. 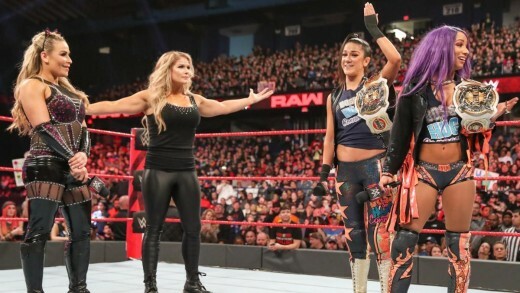 Triple Threat Women's Tag Match Expected? The Women's Tag champions Sasha and Bayley were confronted by Natalya and Beth Phoenix (the Divas of Doom) and exchanged words. Bayley called the Glamazon old, and Banks said Natalya wouldn't have a Wrestlemania match without Phoenix. This lead to a match between Natalya and Banks, which was quickly interrupted by Nia Jax and Tamina, who assaulted the tag champs and Beth Phoenix. I think a normal tag match for the titles between the four women in the ring would be good. Nia and Tamina don't need to get involved. I don't like either woman in the ring, and Jax is a known danger between the ropes. After announcing he'll have his retirement match at Mania, Kurt Angle came out to say his opponent will be... Baron Corbin. The crowd didn't like that unexciting choice at all, and they let it be known. This was followed up with a match against Chad Gable. On paper, this should have been a clinic. In reality it was absolutely dreadful. Angle is obviously two or three steps slow in the ring, and Gable was unable to adapt. After a few botches and miss timed spots, Angle put the match away with the Ankle Lock. Both events here were terrible. If Corbin is the real challenger to Kurt Angle, it's a great mistake. However, I don't think this will hold up. I believe something will happen in the next few weeks to swap out Corbin with another superstar... maybe a "doctor" of some sort...? Say what you will about her promos, heel Ronda Rousey is very believable. Now, I'm not a fan of her promos (specifically the diction of her dialog) but she says it with fure and credibility. Rousey defended her title against Dana Brooke, in what barely qualifies as a match. She hit Brooke with a few knee strikes before locking in a nice Armbar for the win, even holding on for a few seconds after the bell rang. Rousey and her husband, Travis Browne fended off security as they came to stop Rousey from harming Brooke any further. The addition of Browne is an interesting choice for this storyline. Given the options, what match would you rather see for the Women's Tag team titles? Earlier in the show saw Rollins viciously attack McIntyre with a chair in response to his beatdown of Dean Ambrose last week. We also saw the Scottish Psychopath issue a challenge to Roman Reigns for a fight at Wrestlemania. All of this along with the presence of Brock Lesnar gave this main event plenty of buildup. The match itself was great, with a plethora of fun spots throughout. The ending saw Rollins ready to put Drew away with the Curb Stomp before the Beast's music hit. This distracted the Kingslayer, and he turned around into the Claymore for the pin. This was a good way to protect both men in the match, as well as feature the Universal champion at the end of the show. McIntyre looks like he's finally being built up like the powerful heel he should be. Hopefully this is a preview of a future Universal title match. Those were my takeaways from Raw this week. What did you think about the show? Are you excited to see the Divas of Doom again? What do you think of heel Ronda Rousey? Let me know in the comments! Be sure to share this with your friends! As always, thank you for reading and have a great day! 201 Non WWE Matches to See Before You Die #7: Vampiro vs. Pentagon Jr.